The Union Dryer models are designed for use with Class IIIa type solvents, such as hydrocarbon and GreenEarthTM. 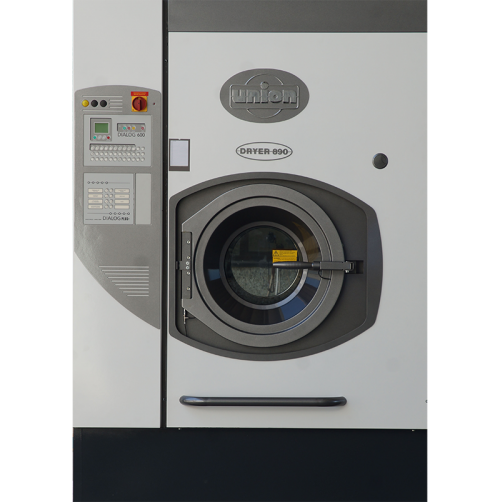 The Union Dryer 850, 890 is available in 50 and 90 lb. capacities. They are equipped with a heat pump refrigeration unit making them close-circuit dryers, without any need for an exhaust to the outside. Optionally, Union Dryers may also be used for drying garments previously washed in high-spin laundry washing machines. They may also be supplied with residual humidity control (optional) which can be programmed to optimize drying of the garments. Union Dryers are fitted with a DIALOG Computer, Large Loading Door, Fast Drying Refrigerated Recovery Section, Steam Heated, Double Air Filters, Standard Safety Tray, Variable Speed Drive Motor (inverter equipped), Electronic Dry Control. Optional Air Cooled Refrigeration Unit (no water required). Easy to Install - No bolt-down required.